I also think it's odd that there was no "trace" and "no footsteps," but I don't know exactly what that means. As we know, details get blurred in translation when they end up in media reports. Did they see no footprints on the trail? Off the trail? Or did they see footprints but were unable to identify the shoe type? It would be interesting to do an experiment with a balcony and a watering can to simulate rain and see how much it takes to make old footprints disappear, then coming back at later times to test the visibility of new footprints. Depth of sand would likely affect the results. But I think the NPS hasty search and rescue must be very hasty. 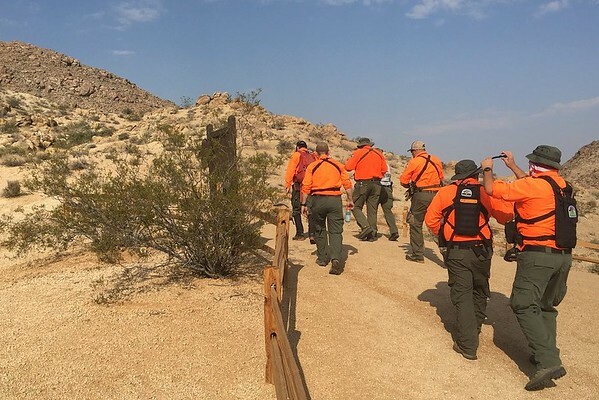 They probably figure they can save lives and not put a bunch of volunteer searchers out in the heat by responding very quickly with rangers and other paid staff. If this has worked very well this summer, we wouldn't know because it wouldn't make much of a news story if people have been found quickly. What is more odd however is that the wife considered him to be missing at 3 hours and that's accounting for the drive time to and from 29 Palms, not just the hike itself. If this is a missing hiker case and not something fishy or foul, then it's possible that he could have been unconscious by the time the rangers hiked the trail that same day. Otherwise he probably would have called back when they called his name, unless he was very far from the trail or deep inside a rock crevice. Sound travels a long ways in the desert. issues, be certain to have proper medications with you and do not hike alone. and wear sunscreen and a hat. Apparently this is the proverbial trail that is uphill both ways... ...Thanks Richard K for the posting, as it clearly illuminates further probable outcomes that would otherwise have been difficult to understand. Actually, all the posts (with the possible exception of my own) offer insights and intelligent observations, which is one of the reasons this is such a fun board. So where is this poor fellow? Lightning response time, clear trail selection and plan, immediate notification of SAR when he missed his expected return time - in short, he did EVERYTHING right and so did his family, and yet here we are. I'm unfamiliar with the trail, but 1.5 miles is little distance to travel, search, or survive. With everything done right, how is this even possible? JT is a confusing place. The trailhead is at about 2,720 ft and the oasis at about 2,800 ft, so technically there's a bit more climbing on the way there than on the way back, since you descend to the oasis and have to clear a ridge or two from the parking lot. But I'm sure signage for the casual visitor is not accurate to the nearest 40 ft like a topo map is. 300 feet over 1.5 miles is not a lot of climbing to do though in the blazing sun it would feel like more. Mr. Miller is described as an avid hiker. I would expect the 1.5 mile trail with only 300 ft of elevation gain to take him about 45 minutes, one way, if the description of his fitness level is accurate and he was motivated to move along to get in one more hike. He's mentioned as playing sports, including softball, so he is not an average tourist. I'm don't know where in 29 Palms they stayed, but assuming it was one of the hotels clustered around the Stater Brothers at 71727 Twentynine Palms Highway that works out to about a 10 minute drive from hotel to trailhead. This means that, hypothetically, once he reached the oasis he had another two hours to possibly travel beyond it before the first searchers headed that way. Cross-country in JT, if bouldering is involved, slows you down to about a mile an hour in my experience, depending on how good you are at picking good routes. Since there is no trail extending beyond the oasis and since the terrain around the oasis is rough, I'd say that is likely an outer bound for how far he may have been able to travel before the first searcher(s) found his vehicle, assuming he did not turn around - and I find it unlikely that he did not turn around, since he had to be back by checkout. Additionally, it seems that it was already in the high 80's by the time he started his hike, so he may have hiked slower in that heat, and been motivated to turn around quicker. So perhaps, he could have gone another 3/4 to 1 mile before searches entered the area. Where am I going with this? In the linked article we find: They were getting ready to check out of their hotel room in Twentynine Palms the morning of July 13, but he wanted to take one more hike in hopes of spotting – and photographing – some bighorn sheep, so he headed for the 49 Palms Oasis trail in Joshua Tree National park. I'm going to guess that Mr. Miller hiked to the oasis hoping to spot some bighorn sheep coming down for water, and failing to see any, he may have decided to go past the oasis a little bit, or maybe climb up to a ridge, in the hopes of finding some. I am hypothesizing that this was something he really hoped to achieve, given that he was squeezing in one more quick hike before checkout. I know how I get when I really, really want just one more thing out of the desert. None of that explains why a thorough search turned up nothing, though I have no idea which areas were searched, how far the search extended beyond the oasis, or any of that. I find the reported lack of footsteps interesting, but as I recall that trail is packed pretty hard so maybe it didn't take footprints well. Or, you could head out to some old trail ( 34.115516, -116.111987 ) in the wash southerly from the parking lot that rejoins the current trail later on, if you had in mind surprising some bighorn in a quieter area. There is another old trail at ( 34.116727, -116.110025 ) as well, but that one is easily visible from the main trail IIRC. If he headed for one of these areas instead he may have backtracked on the blacktop a bit before setting off, which would make finding footprints harder since they won't be where you look first. I'm not sure how much stock to place in the dogs not picking up a scent - I think their effectiveness may be compromised in hot conditions but not sure. Sound does travel far in the desert - I've been able to have conversations with a hiking companion 100ft away as if we were standing next to each other - but in a way it also gets swallowed easily by rocks and boulders. Finally, this bit of information: He also left his cell phone at the hotel – not unusual, Otten said. “He is not a glued-to-his-cell” person, she said. I think there is decent cell coverage on the northerly slopes towards the 62, so he likely was in areas with cell reception at least some of the time. A cell ping or two may have been useful to help searchers know which direction he was going. Incidentally, a different report earlier claimed that he placed a call from the trail. ( http://abc7.com/hiker-missing-for-days- ... k/3778072/ ) Either one of these reporters got it wrong, or speculated about something instead of sticking to facts. Who knows? If the news article posted by Myth is right, his plan was to return by 11 am to checkout, hopefully quickly observing bighorn sheep before then. Not much time. It sounds unlikely that he planned a trip to the oasis and back. I imagine he knew that was not realistic and was not his aim anyway. He may have not even taken the trail. I think all we know for sure is that he is missing and that his car was found at the 49 palms oasis lot and his cell phone in the hotel room. I feel for the wife & family, especially not being able to find him on a short trail, which is not that far from civilization, but there are tons of boulders & canyon-cracks, I'd assume in that area, once around the oasis. Interestingly, both this one, and the couple from last summer, were w/in "sight" of the high desert cities, compared to the many trails deep in the park, (like the area where the one guy was never found around Quail Mt. / Smith Water Cyn. Not to judge, but it puzzles me st times, why so many people, (like many of my clients), dread having to get up early, (5-6am), to beat the heat, (and much better Bighorn viewing chances), yet they will to catch a flight, or other reasons. Being from Canada, I'd assume Mr. Miller was not very heat adjusted. Plus, a large majority of people are normally dehydrated to begin with, which makes for a narrower window before the body (& mind) are negatively effected. Many here may remember the tragedy in New Mexico a few years back with the couple & child in White Sands NM, I believe. I'm sure it's tough to give up hope of a rescue. I do remember several recent SAR's searches where people were found way off the trail, (the couple from last yr.?). I'm not familiar with that trail, and not sure how easy it would be for someone already suffering the beginning effects of heat stroke, to wonder way off route, but not likely if he has some experience under his belt? 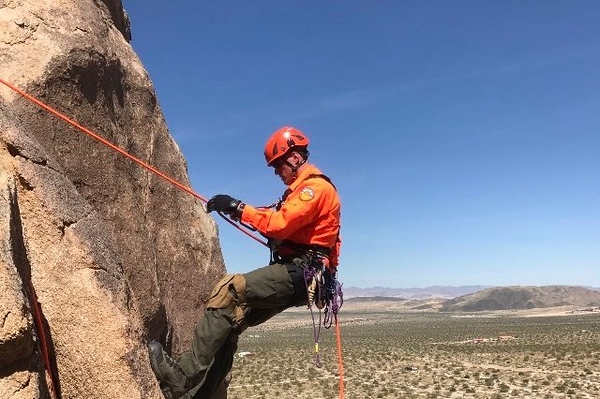 Did someone post here, (or did I read it on JTNP website), where the park has airlifted, (or otherwise), rescued folks a 1/2 dozen times last year in this area? I think this would have been a lot easier to understand if it happened around Indian Cove, where that CG is loaded with huge boulders that go on for miles, a short walk away. I do hope for the sake of Mrs. Miller & family they get some closure, or understanding on what really happened. There is nothing new about the search. The family complains that the park service did not call in the military or the FBI to assist. Their frustration is understandable. My guess is that Miller left the trail looking for a photo op and got lost. He kept walking in hopes of finding the trail or his way out like Ed Rosenthal in 2010. Instead, he just got deeper in. This case is as mysterious as Bill Ewasko given that a search was mounted within hours not days. How far could he have gotten? When the weather cools off this fall, it's likely that a lot of hikers will be out there searching. That doesn't deal with the possibilities that the FBI can investigate, but hopefully that can provide some comfort to the family knowing that at least somebody will be doing something, if they find this discussion thread or others on the web. 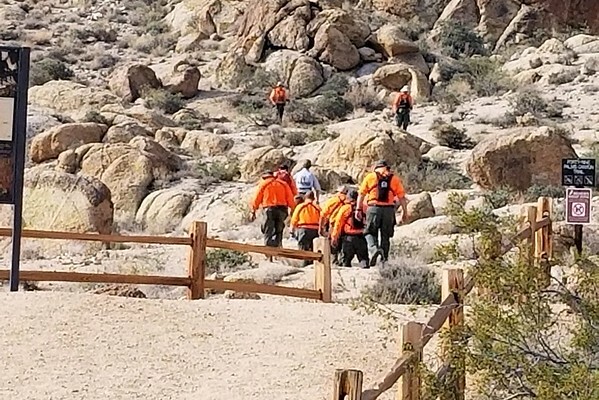 Yesterday (Aug 12th) the Search & Rescue Technical Rope Teams were out in Joshua Tree National Park to continue the search for Paul. Teams were searching the steep canyons the previous grounds teams couldn’t get into. The park reported after this effort that this search yielded nothing. Not a single piece of evidence whatsoever. Increased social media efforts have been set up, please follow and share to help bring Paul home. In the link they seem to be saying that the search was lacking in intensity and that's why he wasn't found. I don't know... I can't imagine being in charge of a search where a guy was going for a short little 1.5 mile hike, didn't show, and the search was underway within hours...given all that, I can't imagine feeling it was even remotely necessary to call in the military and the FBI. My expectation would have been to find him rather quickly and easily, and I would have been dumbfounded when nothing, absolutely nothing, was found. I understand the family is hurting and wish he had been found, especially found in time to save him, but it sounds more like wounded hearts than a reasonable criticism of the search efforts. Strange case, but I don't think the search efforts were lacking here. In fact, I was rather surprised that the response was within hours rather than one to two days lag time.